More than 200 voluntary teachers of primary schools in the hills today burned the effigy of Gorkhaland Territorial Administration Sabhasad Roshan Giri in Darjeeling town and submitted a mass resignation from the Gorkha Janmukti Morcha, the party they were linked to. Five hundred and nineteen teachers are presently serving voluntarily in 129 junior, high and higher secondary schools in the hills over the last 10-15 years. Now, these teachers, under the aegis of the Janmukti Insecure Secondary Teachers' Organisation (JISTO), want to be regularised. On July 8, the GJM disbanded the JISTO’s ‘movement committee’, a sub-unit that was spearheading the regularisation demand after it went vocal about the party leadership’s inability to solve the issue. The JISTO had issued an ultimatum to the GJM and the GTA to find a permanent solution failing which the unit had threatened to leave the party. “He (Giri) should quit as a Sabhasad on moral grounds, as he has failed to help us. Of what use is the GTA if it cannot even solve small issues like ours?” said Amit Gurung, spokesperson for the voluntary teachers. Giri is the GTA Sabhasad in-charge of the education department and is also the GJM general secretary. 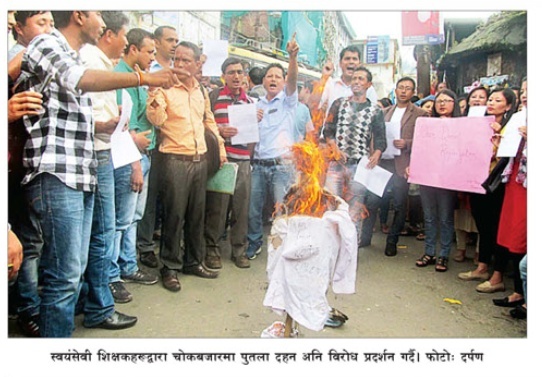 A rally was organised by the voluntary teachers after which Giri’s effigy was burnt in Chowk Bazar in protest. The GJM general secretary though, was unfazed and said it was up to the voluntary teachers to do what they wanted. “If they (JISTO) want to burn my effigy, then who am I to stop them? If burning my effigy will fulfill them their demand, they are most welcome to do so,” retorted Giri when asked to comment. On June 5, the GTA Sabhasad had met state education minister Partha Chatterjee in Kolkata and got an assurance that the process to regularise the voluntary teachers would be started as soon as the state’s chief secretary gave direction to that effect. However, before that, on May 20, the joint secretary of the state school education department wrote to the home and hill affairs department saying regularisation, absorption and appointment of voluntary teachers in the GTA could not be entertained until they secure their candidature through the West Bengal School Service Commission (SSC). But the SSC has remained non-functional since 2003 in the hills.